Amma Makkal Munnetra Kazhagam when shortened to AMMK phonetically is very close to a Tamil slang ‘Ammuk’, that means stashing away, the only word that matters in that alphabet soup is ‘Amma’. How to Join in AMMK? Just follow the below steps to Join in Amma Makkal Munnetra Kazhagam. 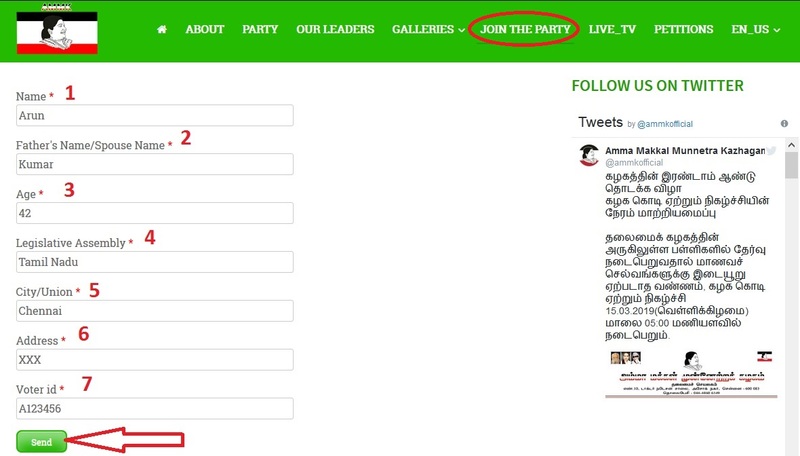 Step 2 : Then click on the “Join the Party” link in the menu bar. MGR was a member of the Congress Party till 1953. In 1953 MGR joined the Dravida Munnetra Kazhagam (DMK) attracted by founder C.N. Annadurai. He became a vocal Tamil and Dravidian nationalist and prominent member of the DMK (“Dravida Munnetra Kazhagam” aka Dravidian Progressive Federation). MGR became a member of the state Legislative Council in 1962. At the age of 50, he was first elected to the Tamil Nadu Legislative Assembly in 1967. Selvi. J. Jayalalithaa Jayaram, an Indian actress-turned-politician, was a six-time chief minister of Tamil Nadu. She was also the General Secretary of the All India Anna Dravida Munnetra Kazhagam (AIADMK) party. She was sworn-in as the chief minister for a record sixth term on 23 May 2016. Jayalalithaa died in office on December 5, 2016 at the age of 68 years after suffering from a major cardiac arrest. Ms. Vivekanandan Krishnaveni Sasikala, married name Sasikala Natarajan, is an Indian politician from Tamil Nadu, who was the general secretary of All India Anna Dravida Munnetra Kazhagam. She was a close aide of J. Jayalalitha, the former Chief Minister of Tamil Nadu, who headed AIADMK from 1989 until her death in 2016. After Jayalalithaa’s death, the party’s general council appointed her as the interim secretary general of AIADMK. T. T. V. Dhinakaran (born 13 December 1963) is an Indian Politician and the Member of Tamil Nadu Legislative Assembly from Dr. Radhakrishnan Nagar. In Past he was the Treasurer of AIADMK Party and served as the Member of Rajya Sabha and Lok Sabha.